Over 90 percent of Vietnamese suffer from dental disease and 85 percent of Vietnamese children have tooth decay, according to the National Hospital of Odonto-Stomatology. Surveys conducted by the hospital show an alarming rate of dental problems among the country’s young: 85 percent of children aged 6 to 8 have decayed baby (milk) teeth, while 54.6 percent in the 9-11 age group have permanent tooth decay. The number of people suffering dental caries increases in accordance with their age and the severity. The rate of children with severely crooked teeth stands at around 80-90 percent. Experts said this was due to children’s baby teeth not receiving proper treatment. The surveys also found that two-thirds of children aged between 6 and 14 never had a dental check-up. Worse still, 100 percent of primary school students are not in the habit of brushing their teeth three times a day. Trinh Dinh Hai, Director of the National Hospital of Odonto-Stomatology, said a shortage of dentists and lack of fluoride in drinking water could contribute to cavities. A lack of professional doctors as well as hesitation to go to see the dentist were the main reasons for the high percentage of people suffering from tooth decay, he said. According to the Vietnam Odonto-Maxillo-Facial’s figures, there is one dentist in Vietnam for 25,000 people, whereas in developed countries the rate is one per 1,000-2,000 people. Gum disease and dental inflammation are the most common oral diseases that cause teeth loss in people over 45, Hai said. He warned that if the disease was not treated in time and properly, it would effect general wellness and appearance. Statistics from the health care sector show that the rate of people losing teeth may be as high as 6.64 per cent for those 45 and older. Recognising the importance of oral health care, a dental school programme has been conducted across the country since 1990, covering all 63 provinces. 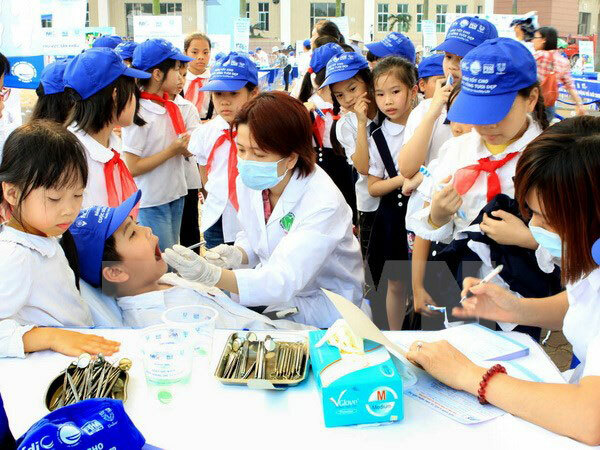 Under the programme, schools hold an annual teeth brushing festival day and other informational activities. The Ministry of Education and Training and odontology hospitals have joined together to raise public awareness of oral health, particularly among primary school children. However, due to limited financial resources and lack of professional health workers, the dental school programmes did not yield the desired results, experts said. To prevent the epidemic of tooth decay, adults and children in Vietnam are advised to brush their teeth at least twice a day, or after meals, and to see a dentist every six months. In addition, special attention should be paid to children’s diets. They should eat fruits and cereal, and less sweet food./.